He admitted his guilt. He explained that he set off the bombs to “defend Islam.” There is an abundance of evidence tying him to the crime. This is simply an attempt to tie up the Infidel’s resources in useless court proceedings — weakening him and rendering him less capable to stop other jihad plots. Lawyers for Boston Marathon bomber Dzhokhar Tsarnaev asked a judge on Tuesday to hold a new trial for their client, citing a Supreme Court decision that a U.S. law stiffening sentences for crimes committed while in possession of a gun was overly broad. Tsarnaev was sentenced to death by lethal injection on June 24 in the 2013 bomb attack, which killed three people and injured more than 260. Defense attorneys on Tuesday argued that Tsarnaev’s conviction and sentence were tainted by the law, which affected half of the 30 criminal counts he faced. The high court found the law overly broad in a hearing on an unrelated case two days after Tsarnaev was sentenced. Federal prosecutors questioned the relevance of the argument, given the magnitude of the attack. 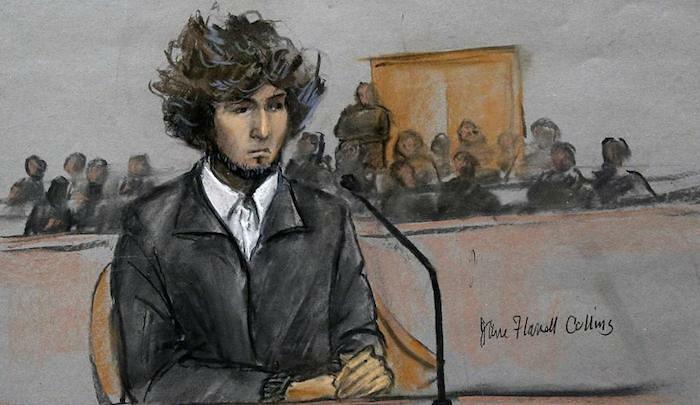 Tsarnaev’s attorneys admitted on the first day of the trial that he played a role in the bombing, and the 22-year-old apologized before sentencing. “There is absolutely no reason to believe … the result would have been any different,” had the charges had no reference that Tsarnaev and his older brother were in possession of a handgun during the attack, said Assistant U.S. Attorney William Weinreb….